Of course, Think about it Thursday is about dreams. Not the ones that happen in your sleep but the goal kind. I think they are called dreams and not goals because of their nature. They are usually a little more 'out there', difficult, out of our foreseeable path, unknown to others, maybe a little crazy. I think we also call them dreams because we ourselves might not even see how they can be accomplished. I had one of those dreams. 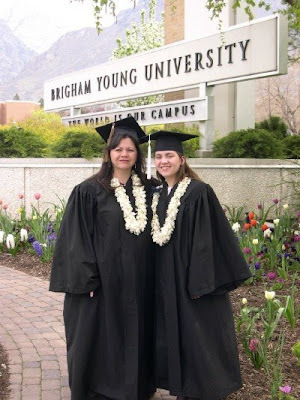 At 17 I went to BYU. I was ill-prepared for college and didn't do well. Add a boyfriend in there, Allen, and well, I ended up academically suspended. (You really should attend class and finals, you can keep the boyfriend) I have always regretted those choices and I dreamed of going back and doing it right. 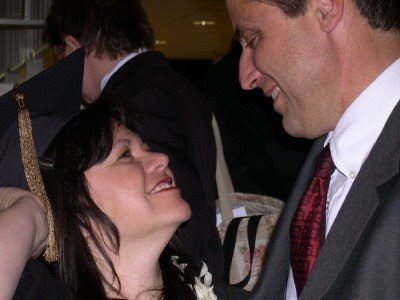 It was a dream because we lived and planned to stay in California, we had many children and life was just happening. I really saw no way of how that would or could ever happen. Well, many things led to others and almost 25 years later I graduated from that same school. (Also, my 19 year old daughter graduated from the same school that same day.) Another one of my dreams was to learn how to paint people and I learned that there. I am totally amazed that all of that even happened and subsequently those dreams have turned into great blessings in my life. That's a long time to wait for a dream. After that much time, I think that if I didn't have the dream (of returning to school, that school, or of wanting to paint people) I might not have recognized the opportunities and more importantly, taken them. So, for Think about it Thursday take the opportunity to search a little for your dreams. Let them surface, at the very least to yourself, and recognize what they are. Even if they're crazy. And if you feel so inclined and bold share them with us. Dreams, dreams, dreams...well the only really big dream I had was to become a mother. To have 7 children of my own (5 boys and 2 girls). To raise a family and be an amazing mother. After 8 miscarriages I'm still trying to convince myself that this dream can come true. My poor husband. I've tried to focus my energies else where, work, schooling, sports, crafts, etc. So I have set other goals (dreams) for myself. Like getting my degree in accounting. Becoming financial debt free. And so on. If only there was more time in a day. If I remember correctly you are helping to raise some fine young ladies. Anyway, I know what you mean about time. I wish I had more lives. That's what I think Heaven will be like - being able to learn and do all the things you wanted to do here but were limited for whatever reasons. And we'll have eternity to do it. That would be heaven to me. I like what-ifs, so what if the things we dream of here have more priority there? What if the things we want earnestly here are put on the 'agenda' first there? Who knows? Just some what-ifs. Sometimes life (and death) get in the way of some major dreams. Now I find it very hard to pick up and dream alone. Or perhaps the WE dreams were so much fun the ALONE dreams look too scary right now.